When we heard that there was a Peri Peri chicken place in Skokie we were pleasantly surprised. Peri Peri is a Portuguese/African dish of spicy peri-peri pepper marinated chicken, popularized in the US and throughout the world by the South African Nando’s chain. We had tried Peri Peri chicken before, but only at Nando’s, which coincidentally now has 2 locations open in Chicago (when Fogo opened there were no Nando’s in the area). There had been some previous complaints about slow service, but we thought it took only a little longer than a typical counter service place for the chicken to be grilled-to-order. This chicken was flavorful and well-spiced, and we appreciated the nice char from the grill. M was also happy that the spicy was actually pretty spicy! The sides were not as successful, so we suggest getting your fill of the finger-licking good chicken. We are happy to have another option for Portuguese chicken in the Chicagoland area. Nando’s fans will be happy to know that Fogo’s is comparable to Nando’s (one can’t help but compare), but with more reasonable prices and more vegetarian options. His personal chef since 1992, Xoliswa Ndoyiya, published a cookbook, “Ukutya Kwasekhaya: Tastes from Nelson Mandela’s Kitchen,” filled with his favorite recipes. “Ukutya Kwasekhaya” means home “home cooking” in Xhosa, Nelson Mandela’s first language, and the recipes in the book exemplify the hearty and delicious home cooking of South Africa: sweet chicken, umphokoqo (corn porridge), and umsila wenkomo (oxtail-stew). However, this isn’t the only book about Nelson Mandela and food. Anna Trapido’s book “Hunger For Freedom” weaves stories about food into Mandela’s biography. Trapido’s book includes recipes by other chefs that were among Mandela’s favorites, including stuffed crabs and chicken curry. I think we will try some recipes in tribute. Nando’s is a South African restaurant chain with locations throughout DC and Maryland, serving up a signature Portuguese/Mozambican speciality: peri-peri (pronounced “piri-piri”) chicken. Peri-peri is the local name for an African Bird’s Eye Chili, grown throughout sub-Saharan Africa. How the pepper came to Portugal is a mystery, but eventually Portuguese and Mozambican (Mozambique being a former Portuguese colony) culinary exchanges gave rise to a peri-peri sauce made from the pepper. The sauce is a staple on southern African and Portuguese tables, and is applied liberally to chicken breast grilled over a spit: peri-peri chicken. Nando’s was founded by members of South Africa’s Portuguese-Mozambican community, and has since expanded to 30 restaurants on 5 continents. Unfortunately, they have only recently made inroads in the USA, and only in the DC metro area. That is unfortunate, Nando’s definitely hits the spot for your stateside peri-peri craving and is well worth a visit. On a recent trip to DC, M visited Nando’s Chinatown location (hence the Chinese characters on the sign) – probably their most popular location in the city. Nando’s logo is a representation of the Rooster of Barcelos, the Portuguese national symbol, and appropriate here because the rooster’s large eye makes one think of the Bird’s Eye Chili. 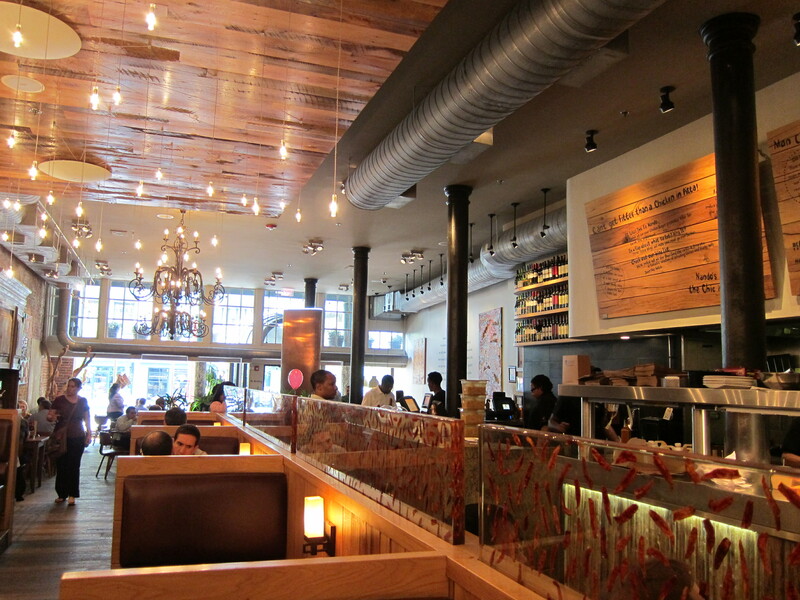 Nando’s does an excellent job of serving up presumably fast food in an upscale setting. Wood paneling and good lighting make for a sophisticated interior, and a central plexiglas wall – actually filled with dried peppers – is a nice touch. The walls are decorated with original works from South African artists, part of Nando’s ever-expanding art collection (now 4,000 pieces) which also offers scholarships to young artists back in Africa. The uniqueness of the food and their commitment to the arts really made me want to like this place, so it is lucky the food delivered. For the relatively upscale vibe, the ordering is simple. You can choose from many entrees, but if we are being honest (and we always are) there is no point in getting anything besides the chicken: pick a half or whole breast, choose your spiciness level, and choose between 0 and 3 side dishes. I selected the extra spicy chicken (of course), with sides of Portuguese rice and a mayo-heavy coleslaw, to reduce the heat from the chicken if need be. After ordering they give you a cute table marker and you proceed to your spot, waiting for the food to be delivered to you. The chicken was – and I cannot overstate this – perfect. Grilled to perfection with just the right amount of marinade, Nando’s then lathered on the peri-peri to add the extra heat I requested. But the flavors come through as well: peri-peri is a complex sauce, loaded with spices and contrasting flavors, and Nando’s variety brought out all the high notes from the pepper as well as the other ingredients. I thought these paired nicely with the rice, which was satisfying though underwhelming. I probably would not get the coleslaw again: it was very good as far as coleslaw goes, but the menu was correct in suggesting it would cut off the heat, which it did almost too well. Next time, I’d order something not as heavy as a side, reserving the slaw for less spice-inclined diners. Overall, for under $15, this was a steal for a weekday lunch. I hope Nando’s is able to expand and open up more locations in the USA, because they would do well given their business model. But if they stray from their signature sauce and effective grilling as a result of the expansion there will be major issues. I’m just thrilled to see good, fast, transnational cuisine like this making inroads in the USA – for now, if you are in the DC area, definitely stop by for a great lunch! It’s the return of recipe Friday! This recipe comes from Faldela Williams’ Cape Malay Illustrated Cookbook. This slim volume covers the unique South African Cape Malay cuisine, developed by the descendents of Indian immigrants to South Africa ( a population known as the “Cape Malays” ) We think this book is probably intended for kids owning to the whimsical illustrations, but no matter – we like it too! Our entree into cooking south african food is the sosatie – a traditional barbecued kebab dish that has many permutations (as all good national dishes do). 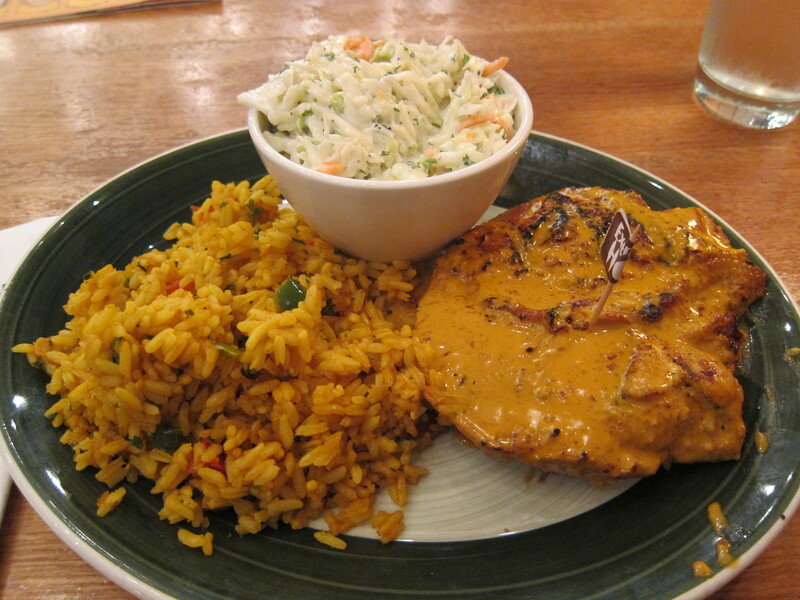 This particular version is made with pork chops instead of pieces of meat. p.s. Sorry, the directions are all in metric! Convert here. Combine the marinade ingredients and marinade chops for one hour. Place meat and marinade in a saucepan with onions and cook, covered, over medium heat for 45-60 minutes, or until meat is tender. Serve with boiled squash and mashed potatoes. This recipe was super easy to make – and it was absolutely delicious. The marinade itself was extremely intense (in a good way) spiced but not at all spicy. We expect it would be good for other meats like chicken as well – or beef kebabs. Throughout our eating adventures we hadn’t yet come across a South African restaurant, so it serendipitous that we found Zunzi’s, a South African lunch spot in Savannah, whilst on our prolific BBQ tour. Zunzi’s is tucked into a cute brick building in a quiet street of Savannah (which is a pretty cute place full of cute brick buildings). Tired and sweaty traveler be forewarned, though, Zunzi’s is only a stand-up counter, so you have to take your food to go or eat it outside on the patio. Inside, Zunzi’s is barely bigger than a breadbox, though there is just enough room for the extensive menu to be written above the counter. The menu boasted a variety of South African-inspired favorites like a Boerewors sausage sandwich (5.95) and an assortment of salads and entrees, with a special section dedicated to vegetarian options. M ordered the Old Indian town Curry Curry Stew (7.50), influenced by the sizable South Asian population in South Africa, while I opted for the Conquistador Roast Chicken Sandwich (7.50), an admittedly more Americanized choice. When our food arrived we were absolutely shocked by the portions, each was big enough for 2 hungry eaters (and we were). Take a look at that curry! M enjoyed the hearty pea, carrot and potato curry, though it might have been a little mild for his fire-breathing tastes. My chicken sandwich was basically the size of a whole baguette, as you can see below, and was completely overstuffed with fresh roasted chicken. I especially liked the 2 mystery dips on the side – one was a riff on a tangy thousand island, and other was a creamy garlic sauce. Even though it was sweltering outside, we decided to rest our feet at the outside patio, which was decked out with rainbow umbrellas. We were joined by an array of lunching Savannah College of Art and Design summer school students, also enjoying some midday nosh. With the breeze, despite the Georgian heat, it made for a quite pleasant lunch al fresco. We can definitely understand who they attracted a bustling lunch crowd. The first question we were asked when we relayed our daytrip to Savannah was if we visited Paula Deen’s restaurant – well, we saw the building – but give us the gut-busting portions at Zunzi’s any day. We liked the last dish from Marcus Samuelsson‘s book so much we decided to give it another try this week. 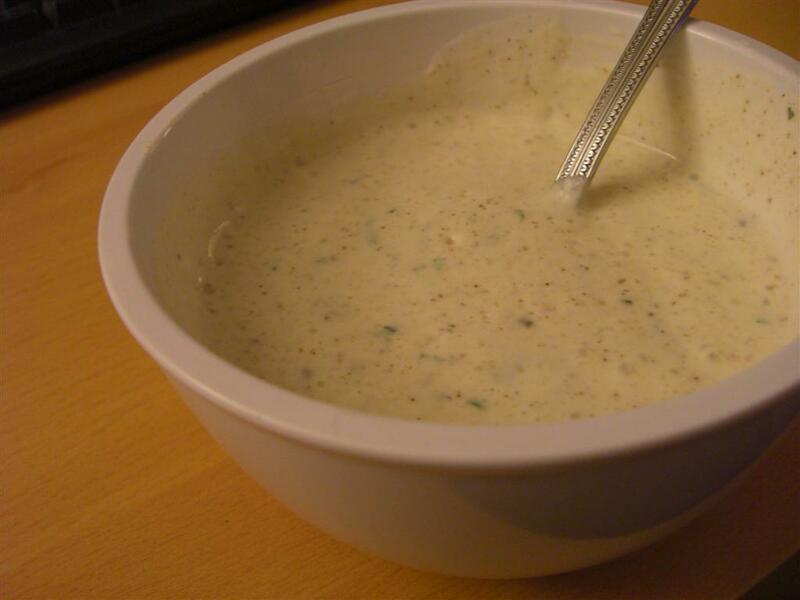 M is a big fan of yogurt sauces, so we were intrigued by a recipe for a yogurt sauce introduced by Indian immigrants to South Africa during the late 19th century. The dish is intended to take some of the heat off the spicy South African fare, while adding a good dose of tangy flavor at the same time. Set a fine-mesh sieve or colander lined with cheesecloth over a bowl (we used our colander and a sturdy paper towel). Add the yogurt, cover with plastic wrap, and let drain at room temperature for 2 to 3 hours, or leave in a refrigerator overnight. Heat the olive oil in a medium saucepan over medium heat. Add the garlic, ginger, and chili and saute until the garlic is golden (about 5 minutes). Add the coriander and cumin and saute until fragrant (about 2 minutes). Let cool briefly, then transfer to a blender, add the lime juice and drained yogurt, and blend until smooth. Transfer to a bowl and fold in the cilantro and parsely. Season with salt and pepper. We have to say, this yogurt sauce is fantastic. Its smooth and tangy, with just the right combination of spices. It would be great on a salad, or wrapped in a gyro with grilled steak or chicken strips. It should store well for at least four days, so we will have to cook up some dishes later this week that make use of our new culinary find. The best part? 7-minute preparation time, all from ingredients we usually have readily available – only cumin was esoteric enough to warrant a grocery trip. We’ll definitely be making this again, possibly alongside another recipe from this great book.